1. 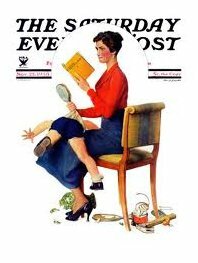 In 1933 Norman Rockwell provided the Saturday Evening Post with a cover illustration featuring a mother with a child over her knee and “child psychology” book in hand, reading the instructions on spanking. 3. The government stepped in to advise parents. Many states produced handouts with a recommended daily schedule. One handout produced by the Minnesota Department of Health recommended a “sun bath during the morning” and that the entire day should be spent outside---naps should be taken in the sun if the weather permitted. This was long before the invention of sun block! 5. In her book, Perfect Motherhood, Rima D. Apple tells a wonderful story from Hollywood about a scene in a 1939 film Bachelor Mother, starring Ginger Rogers and David Niven. In a Hollywood-esque series of plot twists, Rogers, a single woman and sales clerk, becomes caretaker of an infant. David Niven is the son of the store owner and stops in to check on how Rogers, in whom he is interested romantically, is doing with the baby. When he arrives Rogers is feeding the baby, and Niven inquires how she knows she is doing it correctly. Rogers notes that it is not complicated. She puts the food on the spoon, puts the spoon in the baby’s mouth, and the baby swallows it. Niven grabs a childcare manual to verify that this is proper…he soon reads that the doctor “with twenty years experience” notes that Rogers is doing it wrong, that the food is to be rubbed into the child’s navel. Reflecting the spirit of the day, Rogers is clearly torn: The experts should know---but on the other hand, the baby had been happily eating. She takes the book from Niven’s hands and reads the section herself—only to discover that several of the pages were stuck together, and the “rubbing into the navel” treatment actually involved warm oil and was a treatment for colic. She went back to her own method of feeding the baby. As Amy Chua’s book, “The Battle Hymn of the Tiger Mother” climbs today’s best seller lists, it’s probably wise to remember Dr. Spock and his belief in parental instinct: “Don't be afraid to love [your baby]. . . . Every baby needs to be smiled at, talked to, played with, fondled -- gently and lovingly. . . . You may hear people say that you have to get your baby strictly regulated in his feeding, sleeping, bowel movements and other habits -- but don't believe this. He doesn't have to be sternly trained. . . . Be natural and comfortable and enjoy your baby." To read more about America’s past, please visit www.americacomesalive.com, or on Facebook at www.facebook.com/AmericaComesAlive. Kate’s website is also a wonderful resource for parents and families, providing little-known stories of America’s past and information for sharing our rich heritage with children, so be sure to check it out!